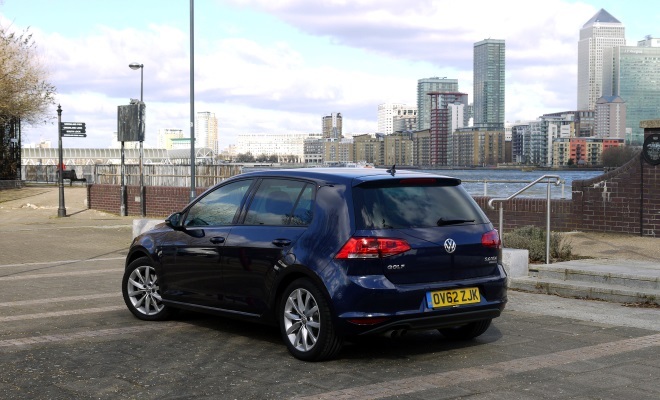 The new seventh-generation Golf is the first of the breed to provide a selection of driving modes, a feature of all cars sold in SE trim or above. The modes are accessed via a two-step process. First, thumb the mode button lurking down by the gear lever. Next, prod one of the four separate options that spring up on the central touchscreen – choose among Sport, Normal, Eco or Individual. Each mode brings tweaks to steering and throttle response, the keenness of the climate control and various other alterations, according to the particular bits of tech that happen to be fitted to the car. As the name suggests, the Individual setting lets the driver tailor requirements to blend, for example, Normal steering weight with Sport engine response and Eco aircon. Whatever mode is selected is memorised and remains in place for the next journey. 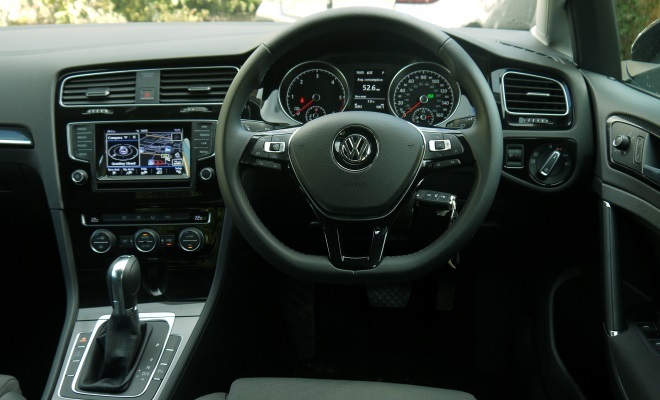 In cars fitted with VW’s dual-clutch DSG gearbox, the modes also govern the automatic shift behaviour, making the choice of mode infinitely more obvious from the driving seat. To take a closer look at this stuff, I’ve borrowed a new Golf 2.0-litre TDI fitted with a six-speed DSG transmission, in sporty GT trim. With a list price of £24,880, this happens to be the most expensive model in the new Golf line-up, at least until the seventh-generation hot-hatch GTI and GTD models arrive in the summer. 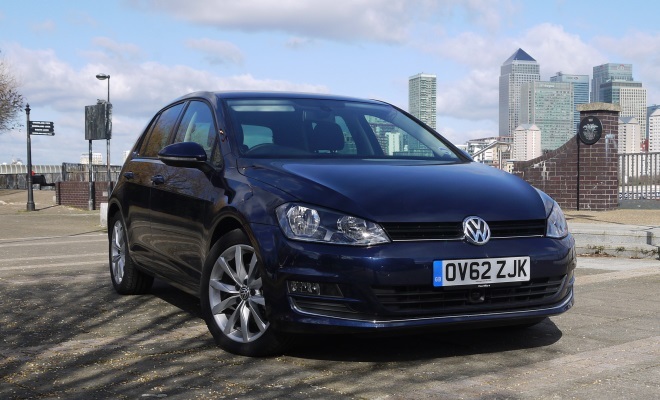 The diesel engine develops a peak of 150PS (148bhp) and a fulsome 320Nm of torque, making this Golf variant feel reassuringly rapid. Surprisingly so, given relatively modest CO2 output of 119g/km and official economy of 62.8mpg. The sprint to 62mph is waved aside in 8.6 seconds. 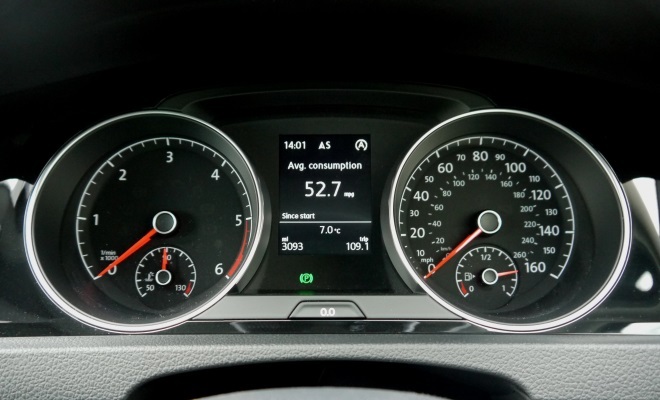 That’s impressive but not quite as quick as the 8.4-second zip managed by the nearest petrol equivalent, the 1.4 TSI ACT model, which may be ten horses down on power but is a noticeable 87kg lighter, and has seven DSG speeds to play with rather than six. The petrol car is also a few grams cleaner in CO2 terms and £500 cheaper, making it quite hard to see on paper why you’d choose the 2.0 diesel engine, to be honest. The chosen driving mode does make a marked difference to the behaviour of the car. In Sport setting, the gearbox will react smartly to every flex of your right foot and hang onto ratios with a dog-and-stick determination, only grudgingly settling down to something below an angry snarl once you’ve made it completely clear you’ve finished accelerating. Taken together with more eager throttle response, the result is a car that makes the most of its available pace at the expense of your nerves and eardrums. You’ll also pay for your frivolity at the pumps, of course. The electrically assisted steering also becomes noticeably stiffer to twist in Sport mode, though if it also becomes more communicative the difference is slight. Perhaps on a damp road, any impending loss of front-end grip will become more obvious with the heavier weight, but I didn’t fling the car around wildly enough to find out. The gearbox also comes with wheel-mounted paddles, which will let you drop a gear or two prior to overtaking, whether or not you’ve previously pushed the gearstick sideways into its manual slot. You only need to select the manual slot if you want to supervise all gear changes, rather than the occasional manoeuvre. Switching over into Eco mode, the car’s throttle response becomes – as expected – much more elastic. With the gearbox shifting early, you end up using the engine’s low-down torque as opposed to its upper-end power. It works surprisingly well. I was able to overtake smoothly on motorways without dropping out of sixth, for example, due to the onset of full torque at just 1,750rpm. Eco mode’s most remarkable trick occurs when you lift off the throttle, however. Both of the DSG’s two clutches disengage, dropping the transmission into neutral and letting the engine settle down to idle at about 950rpm, irrespective of road speed. That leaves the car free to glide serenely along using whatever momentum it happens to have. Down even modest hills, it’ll speed up. The utter absence of engine braking can feel disconcerting if you’re not expecting it. Back off as you approach a roundabout, say, and the car simply won’t slow down until you start to brake. At this moment the gearbox will seamlessly shift into a suitable gear to help you shed speed at whatever pace you dictate through the pedal. The alternator will also switch into a high-voltage generating mode, to scavenge more energy for the battery, though you’d be hard pressed to detect this regenerative braking from the cockpit. After a short period of adjustment, I really warmed to Eco mode and found it preferable to the Normal or Sport mode for most types of road. One of the neat features of the DSG gearbox is that a quick tug backwards on the lever will switch the car into Sport mode, from Normal or Eco, and another tug will switch it back again. So it’s easy to leave the car in Eco mode for everyday driving and still have full Sport capability in reserve, available at the flick of a wrist, for overtaking moments, exiting junctions, or any stretch of road that looks like fun. I was also impressed with the economy I saw, with 52.7mpg the result of one 109-mile trip where I’d been flitting frequently from Sport to Eco and back again. 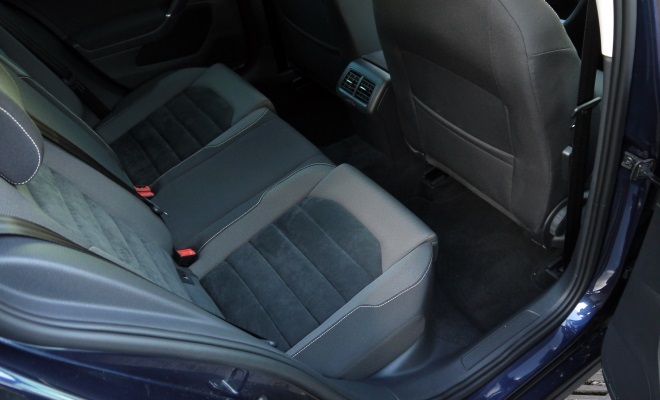 One other peculiarity of this car arises because of the combination of an automatic gearbox, an electronic handbrake and an engine stop-start facility. 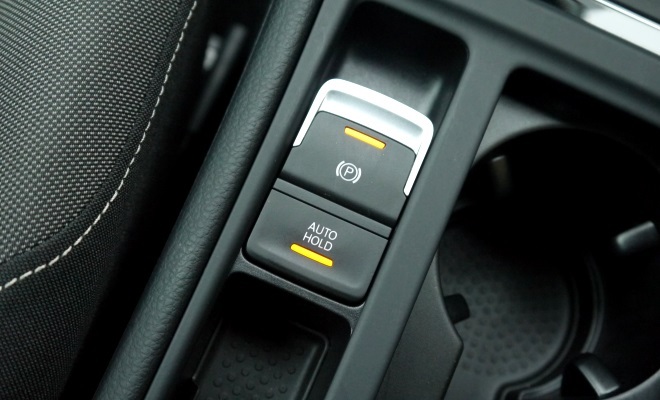 The handbrake is split up into two parts - a little flap of a lever that you can toggle to engage or release the brake, and another button marked “auto hold”. Prod this second button and the handbrake will automatically engage whenever the car stands still, eliminating the typical forward creep of an auto-transmission and letting you rest your feet without the bother of setting the handbrake. The brake releases smoothly as you start to accelerate away again. Less obviously, what your thumb does with the auto-hold switch also governs the behaviour of the engine’s stop-start function. If auto hold is switched off, the stop-start system will sit watching the foot brake. As long as you hold the car motionless, the engine will shut down and sit dormant (once warmed through) but will quickly spin into life the moment you lift your foot. That means the engine is alive and ready to react by the time your toe reaches the throttle pedal. If auto hold is active, by contrast, the stopped engine will carry on slumbering even after you step off the brake, only stirring when you prod the accelerator to set off again. The small problem that creates is that the engine can’t simply start instantly. In the brief half of a second it takes to whir into action, you can’t help but keep pressing the accelerator towards the carpet. By the time the engine is ready to go, the throttle will tend to be a little too wide open, making it embarrassingly easy to lurch awkwardly away as if you haven’t quite learned to drive. As a result, I wound up tapping the throttle for an instant to wake the engine before setting off. It’s a predictable means to get away smoothly, but it’s not exactly ideal. The rest of the car is rather better sorted. The new interior is smart, feels great and seems beautifully put together. It’s easy to see how it seduced Car of the Year judges to carry off the 2013 title. But having spent a week with the car, I started to wonder if the layout might be a little dated. In 2013, with a centre screen no longer an expensive option, isn’t it in the wrong place? Shouldn’t it be higher up the stack, above the central air-vents rather than pushed down below them? That would bring the screen closer to the driver’s eyeline – as it is in the new Peugeot 208, for example. This is the level at which you have to quibble about the new Golf, though. It’s completely obvious that everything about it has been carefully designed, engineered, and generally thought about – even the way minor controls move and click seems to have been considered from the perspective of visual, tactile and audible feedback. I was particularly impressed with the GT’s ride, on its 10mm-lowered sports suspension. It manages to marry agility and control with a generous serving of softness and composure, in much the same way a skilled chef mixes flavour, scent, texture and presentation. It made for quite a stark contrast with another premium hatchback I tried recently that was a chilli-stuffed doner kebab in comparison. This is a very, very good car but not quite a great one. 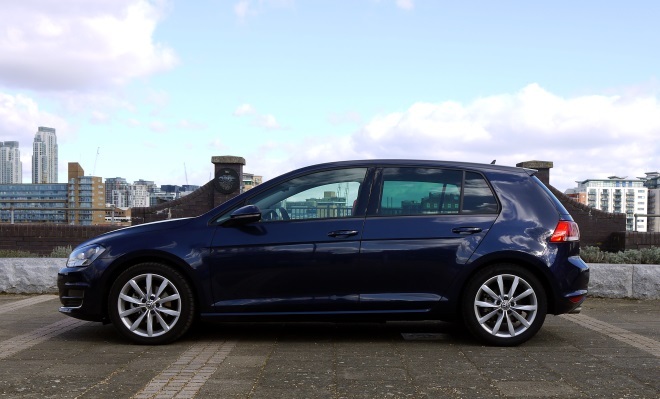 I’ll reserve one star out of my rack of five until I’ve driven the BlueMotion Golf, due later this year.